About Willis Machinery & Tools Co.
Willis Machinery, a metalworking machine tool supplier can be your single source for lathes, grinding machines, mills, drills, and many other metal, chip-making machines of both CNC and conventional configurations. Willis Machinery Celebrates 55 Years! We’d like to say thank you to all of our past, current, and future partners. This couldn’t have happened without you. In 1963, Willis Boice started offering Solberga Upright Drills and Bergonzi Radial Drills, along with a variety of work holding items. Fast forward to 2018 and Willis Machinery is your one stop shop for a wide array of CNC and conventional lathes and milling machines, upright and radial drilling machines, and surface and cylindrical grinders. Whether you are a multi-billion dollar manufacturer or a smaller job shop, Willis Machinery will meet your needs and surpass your expectations. From the beginning we have always looked to build high quality long term relationships with all of our vendors, distributors, and customers. These strong bonds have been a key to our mutual long-term strategy and success. Over the last 55 years, our people have traveled the Country listening to what customers’ wants and needs have been. After acquiring this insight, it is only then that we’ve gone out and traveled the world to find the best solutions for these needs and then bring those solutions to the market. With partners like you, we hope and believe we can be successful for another 55 years. We are very grateful to all of you who have placed your trust in us to provide outstanding service and equipment. Your challenges and feedback have pushed us to continually improve. The bonds that we’ve developed are a tremendous source of strength and knowledge that will continue to guide us toward shared prosperity in the future. "Probably the best thing next to the Willis products is your team’s knowledge of the products you sell. If parts are needed and not on your shelf, the expedite process is very efficient. Willis Machinery provides superior sales and service with a high quality product." "Willis Machinery has been the most reliable machinery sales outfit we've ever dealt with. Their machines consistently perform well above industry standards. They don't change manufactures, or machine designs constantly like most of their competitors, thus keeping parts availability at an optimum level. Dealing with their service department is like none other. You contact them and immediately get a price or the answer you were looking for. Most of their competition has to order machines, thus making for long waiting times, not Willis, They've always had the machines in stock that I've ordered. If you're looking for an outstanding machine, and a company that stands behind them, then Willis Machinery is the outfit you're looking for." Since 1963, Willis Machinery and Tools has been a machine tool supplier, serving a wide variety of businesses throughout the world. With over 50 years of providing products and services to businesses wordlwide, Willis Machinery has become a very knowledgeable and respected supplier of CNC and conventional machinery. As a member of The Association for Manufacturing Technology (AMT), Willis Machinery supplies a large number of machine tools to customers in Michigan, Ohio, Indiana, and Pennsylvania. 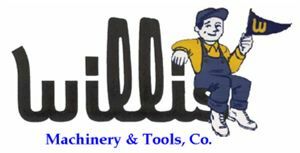 Willis Machinery also serves a wide variety of businesses throughout the world with the help of authorized Willis machine tool dealers and direct salespeople. Our warehouse, conveniently located in Toledo, Ohio, is stocked with more than one hundred new machines as well as thousands of spare parts. Our Toledo facility also has an extensive showroom, demonstration area, and an in-house tool-room to make machine retrofits, modifications, and repairs very efficient. Willis Machinery & Tools has been supplying top quality metal working equipment from manufacturers in Germany, Italy, Korea, Poland, Sweden, and Taiwan. Many of these relationships have been strong for 50 years.